The field is set. With the Arizona Diamondbacks' raucous victory over the Colorado Rockies in the 2017 NL Wild Card Game, Division Series play will begin with both top-seeded wild cards moving on to face the top-seeded division winners. Arizona takes on the overall #1 seed Los Angeles Dodgers with a 43% chance of pulling off an upset. The Dodgers' odds of advancing decreased slightly as their chances of playing the weaker wild card team dwindled from 41% to 0%. They are nevertheless the NL favorite in my simulator with a 33% chance of winning the pennant and a 16% chance of winning the World Series. The betting markets disagree with me on this last point, with Bovada's odds indicating that I'm undervaluing Los Angeles by about four points. Conversely, Bovada bettors see me overvaluing the New York Yankees' World Series chances to a similar degree. 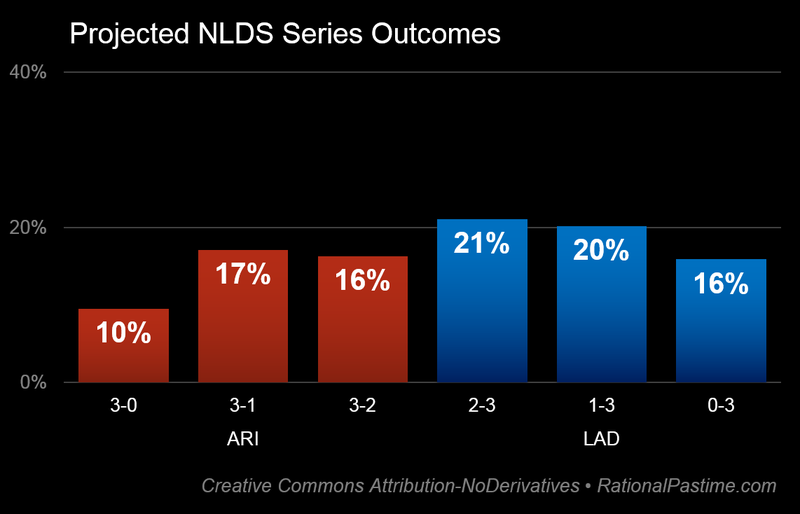 The Dodgers have the advantage against Arizona, but (as is the case in just about any baseball playoff series) the odds are not insurmountable. The Dodgers best bet is to win at home in game five while the Diamondbacks would do best to finish it off in game four. 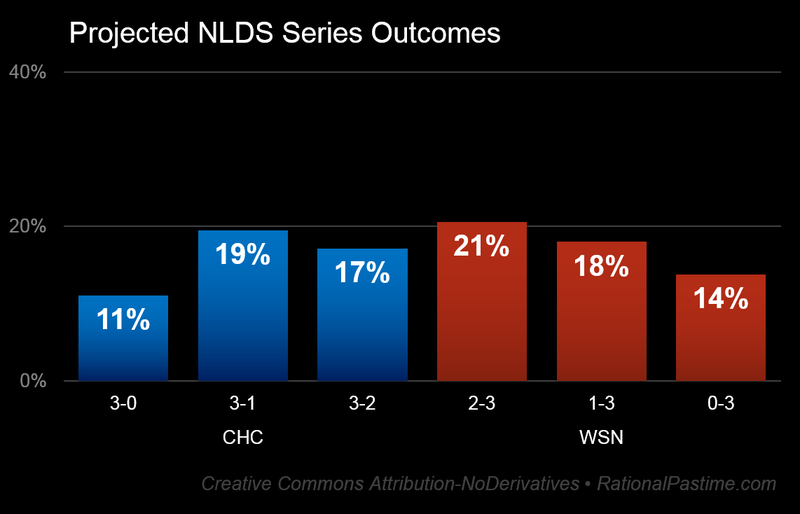 In the other National League Division Series, the Chicago Cubs and Washington Nationals are basically neck-and-neck, with the Nats enjoying a slight 52-48% edge. Tonight's contests feature the first two games of the American League Division Series, with the Cleveland Indians 56-44% favorites over the New York Yankees and the Houston Astros with a 61% chance of thwarting the Boston Red Sox. 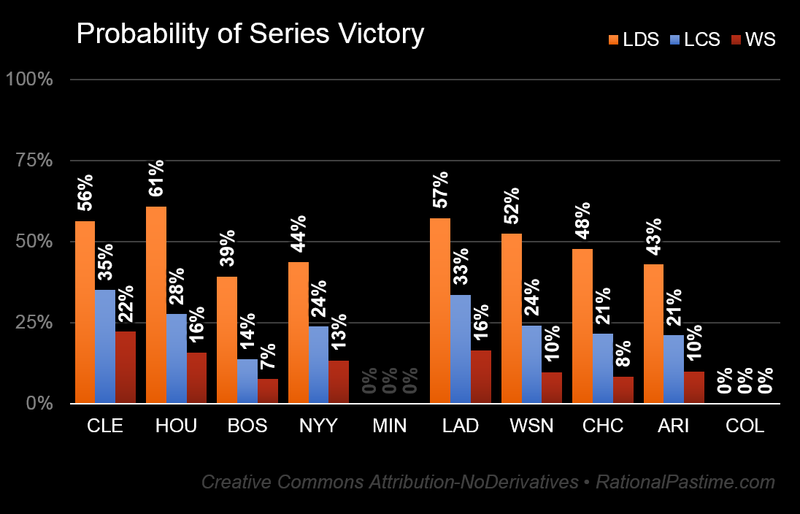 For more on this matchup consult yesterday's playoff odds post. Check back tomorrow to see how the results of the two opening games of the ALDS affect the playoff odds of the nine eight surviving teams in the 2017 MLB Postseason.